ECS has released its new Thin Mini-ITX motherboard designed for Intel’s Coffee Lake-S processors. 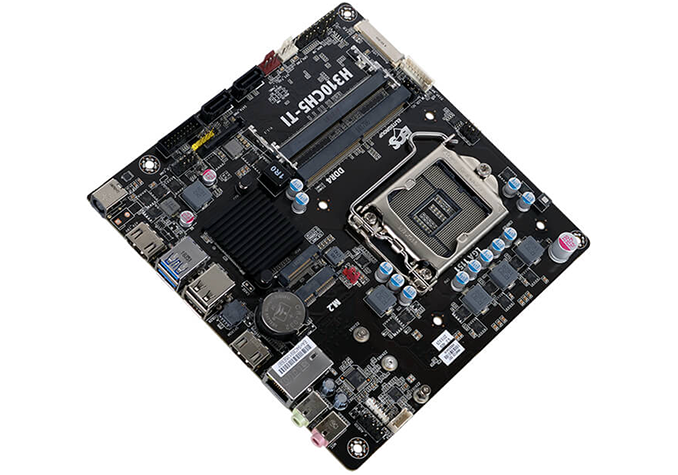 The H310CH5-TI mainboard is aimed at miniature systems as well as upgradeable all-in-one desktops compatible with the said form-factor. As the name suggests, the ECS H310CH5-TI is based on Intel’s H310 chipset and therefore supports the company’s 8th Generation Core i3/i5/i7 processors, as well as their cheaper Celeron and Pentium-branded brothers. The motherboard is outfitted with a 4+1-phase VRM that uses solid-state coils and capacitors to prolong lifespan of the platform and ensure stability during high loads. Unfortunately, ECS does not disclose which specific CPUs are qualified for the mainboard, but keeping in mind rather limited cooling that a Thin Mini-ITX chassis can provide, I wouldn't expect this board to be used with anything over a 65 W TDP chip. 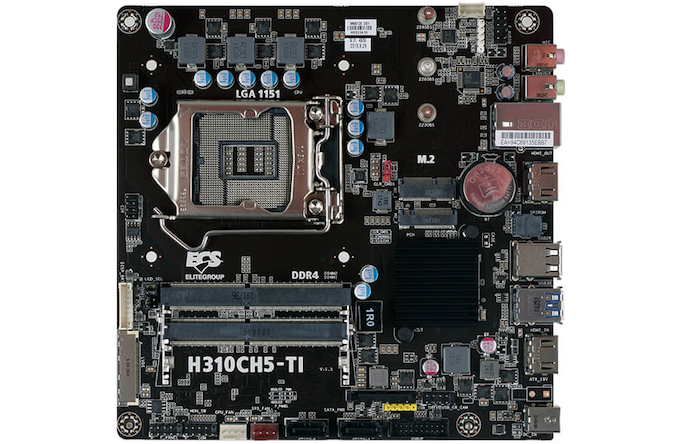 The H310CH5-TI has two SO-DIMM slots supporting up to 32 GB of DDR4-2667 memory, one M.2-2280 slot for PCIe/SATA SSDs, two SATA 6 Gbps connectors, and one M.2 slot for a Wi-Fi/BT controller. I/O capabilities of the motherboard are pretty typical for a Thin Mini-ITX platform. The motherboard has a GbE port (controlled by Realtek’s 8111H chip), one HDMI 1.4 output, one HDMI 1.4 input, four USB 3.0 Type-A connectors (two internal and two external), two USB 2.0 Type-A ports, and two audio jacks. It is noteworthy that the audio subsystem of the H310CH5-TI is comprised of the Realtek ALC662 codec and a six-channel DAC. Since Slim Mini-ITX motherboards can be used for special-purpose systems and highly-integrated AIO desktops, the ECS H310CH5-TI also has numerous internal headers, including a card reader header, a webcam header, a touch board header, a camera header, an IR sensor header, and so on. ECS has not disclosed pricing of the motherboard, but typically Intel H310-based boards are among the cheapest. I didn't look at the manual, but I have some experience with wild guessing. The slot closer to the southbridge looks like a B-key connector. This is provides PCIex2, SATA, USB, I2C, and at least a couple of other protocols. This is usually used by SSDs, but also some WiFi cards. The one further away looks like an E key, which cuts the PCIe down to one lane, no SATA, but the rest is still there. AFAIK, this is commonly used by WiFi cards. So the shorter wifi card goes in first, and gets secures. The M.2 SSD slot uses a slot with (still guessing) greater offset from the PCB, which allows it to go over the WiFi card. The standoffs for the screw is probably higher, too. The other inputs make it look like it's made for kiosk work. This looks nice, wish there are thin M-ITX with the Zchips available? Also, I see a 19VDC input for power which is very nice. But is there also an internal header for 19VDC?